​November 2015 - A 66 year old lady presented with a sore lower back and left hip, with the occasional collapsing of the right leg. The lady had had the problem since she was a teenager. To compound the issue, 50 years of favouring/limping on that leg had contributed to osteoarthritis. See Treatment below. 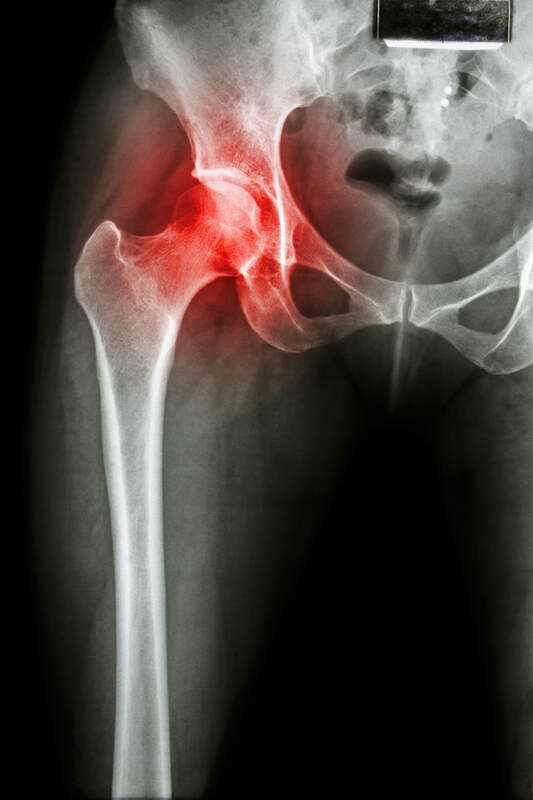 NOTE: Often when a person has pain in a joint, an x-ray or CT-scan may show arthritis, which leads the doctor to suggest NSAID’s [Non Steroidal Anti-inflammatory Drugs], or failing that, then surgery. Please click here to appreciate the dangers of these drugs. This is a severe fault with modern medicine. In the quest to provide the burden of proof as is favoured by science, simple remedies are generally overlooked. It has been my experience that remedial massage which corrects the length of the muscles proximal to the offending joint, often alleviates most of the pain, and in fact often all of the pain can be alleviated. The treatment causes the joint to be stabilised by facilitating improved bio-mechanics, which in turn leads to strength gains and increased ROM (Range of Movement); thus contributing to an improved lifestyle which is not compromised by pain. ​[Editors note] ---- The point is that everyone has arthritis, but not everyone has pain. Therefore, arthritis should not be considered as the cause of the pain, rather the site of the pain. 1. The treatment involved massaging Erector Spinae, and mobilization of Quadratus Lumborum, with Trigger point therapy across Iliac Crest and Gluteus Minimus. 2. A passive lower back stretch which involved the client in a supine [on back] position, drawing right hand across and behind left knee. Then, the lower body was rolled across to right while both shoulders maintained contact with table (demonstrated by image on Left). The stretch was held for a minimum of 30 seconds on each side. 3. However, when repeating the stretch with the other leg it was found that drawing the left leg across caused pain to be referred to the knee and Rectus Femoris muscle. 4. Releasing the Adductors [inner thigh] was necessary at this point which allowed a limited stretch, but a stretch which involved less pain. This was an hour of fairly intense treatment; fortunately the patient was able to walk from the clinic with very little pain and with the leg that had been rotated outwards – now straight. However, in this case which has been so long-standing, i.e. 50 years, a strengthening regime is required to bring long-term improvement. The muscles that had atrophied over the years must now be strengthened. Incidentally, at the second treatment the previous gains were still evident, and her previously collapsing leg was not .